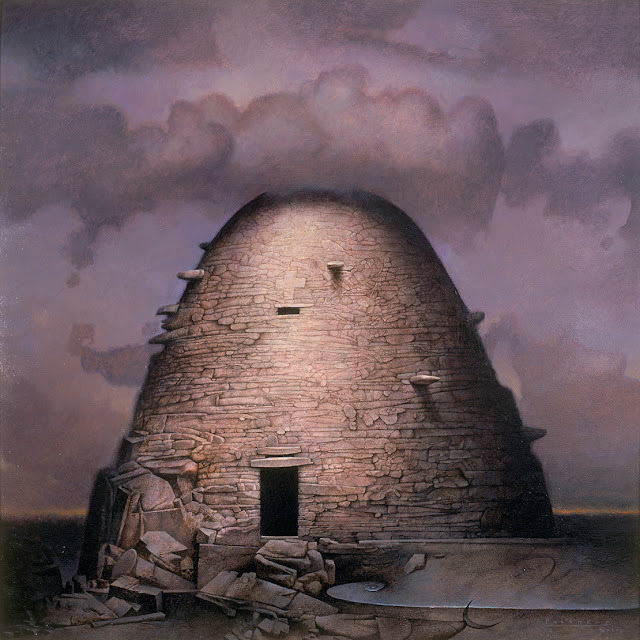 Here’s a bit of a news... the site of the first Jedi Temple that appears at the end of Star Wars: The Force Awakens, known as Ahch-To, is actually a real place, and I walked there more than fifteen years ago. It brought a tear to my eye when I recognized the location at the end of the movie. They added a few smaller special effects islands in the background, but it still looks exactly as they pictured it. When I was an artist in residence in Ireland I took a boat trip out to the Skelligs - particualrly Skellig Michael. When I first saw the island looming as the prow of the boat raised and lowered in the ocean swell… all I can say it was a spiritual experience. Sean Fenin the boat Captain we hired said we might not make it out there once we cleared the Bolushead peninsula… the Atlantic Ocean’s full force is felt as you round Bolushead. He was a cool guy let me crawl all over the boat and photograph (the boat was more like the fishing trawler in JAWS!). Luckily the currents and weather was decent that day… it does change by the minute. As we drew closer I knew this was a special place. Nothing looks like it on the mainland of Ireland. The Irish call the Skelligs - the "praying hands” that is what they resemble as the two islands rise out of the ocean ( monks lived there many centuries ago)… the Great Skellig and the Little Skellig. You can look it up online. Now everyone will want to go there. They already limit how many people can visit per day… I hope it doesn’t get ruined by all of the foot traffic. It is a World Heritage site. When I first visited the Skelligs back in 1999 I said if Lucas or Spielberg were ever to see this place they’ll want to feature it in the next Indiana Jones. Well - I got the wrong genre. The artist village of Cill Rialaig is on the Bolushead peninsula and in the area. Here’s a painting that I created and sold in Ireland… it’s of one of the beehive stone huts that the monks built and lived in on the Skellig Michael. It’s all dry stone construction. The protruding rocks were used as steps. The monks climbed them to open and close the fire vent at the top of the structure. I was so impressed by the geology and spiritual presence of Skellig Michael I floated it back in 1999. This was drawn from the Bolushead Peninsula on the mainland. 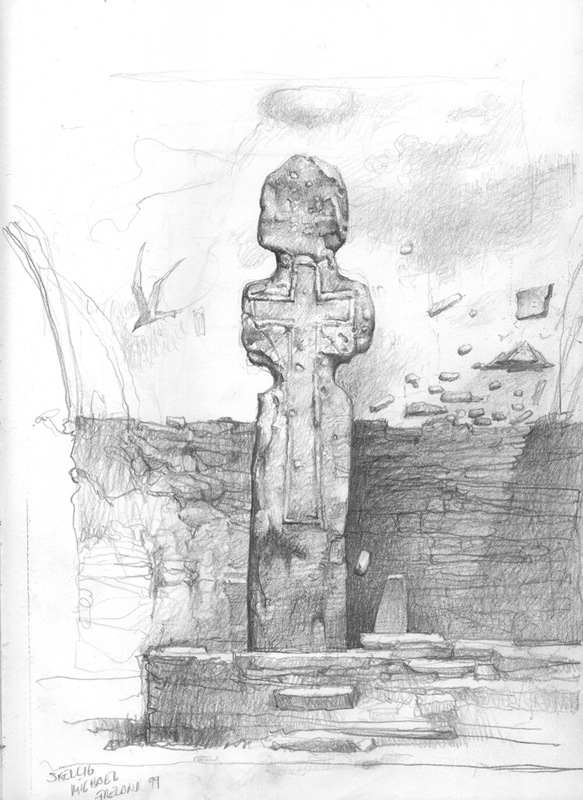 Finally - one of the weathered stone crosses in the monk’s graveyard on the island - floating Skellig in background. 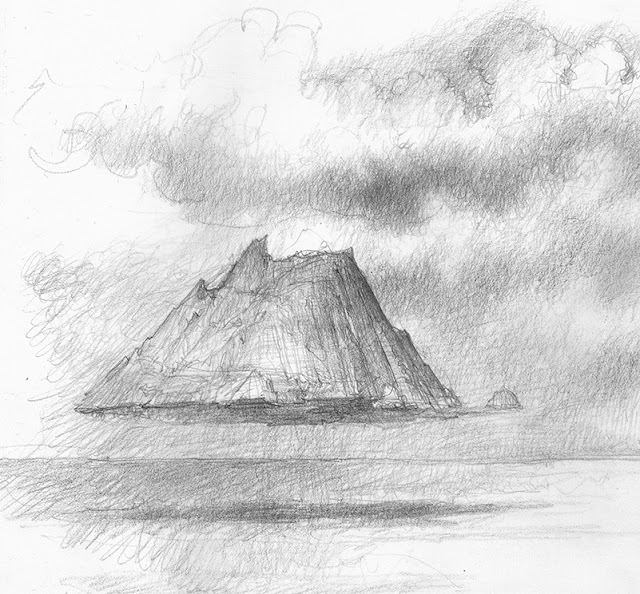 There is also a rock on the Great Skellig that they call 'The Wailing Woman'… it looks just like a Henry Moore sculpture. I have yet to do a drawing of it. I was invited back to be the artist in residence this last summer but couldn’t afford to go. Geesh - could been having drinks with Mark Hamill and JJ Abrams at the local pub!